Studies show that approximately 80 percent of what a child learns in school is information that is presented visually. If your child is showing signs of not doing well in school, one basic area is to check their vision. 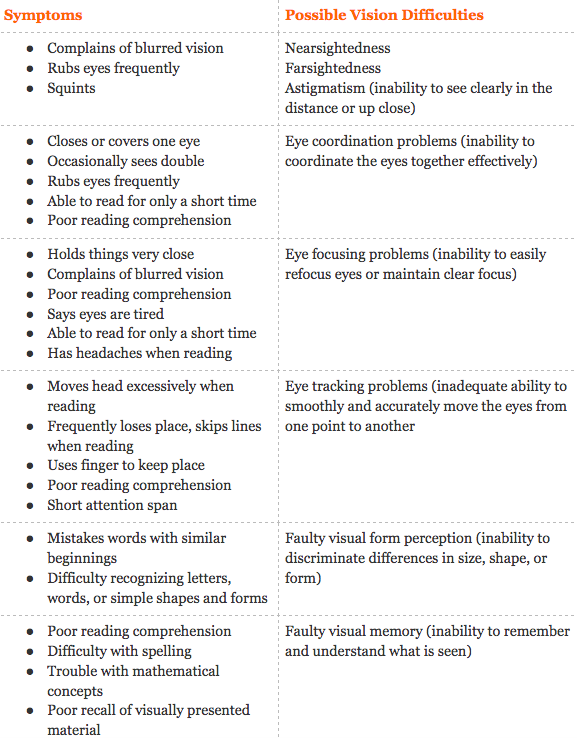 According to the College of Optometrists in Vision Development, below is a table of symptoms and their associated vision problems. If you suspect your child has any of these symptoms, we recommend booking an appointment with Dr. Jean-Pierre Guillon. Jean-Pierre has a special interest in children’s vision and will assist in correcting any learning related vision difficulties your child may be experiencing. Furthermore, we recommend you contact your child’s teacher at school, so they can assist where possible. Sometimes children with learning-related vision difficulties can go through emotional problems like anxiety or low self esteem. Reassure your child that these difficulties have nothing to do with a person’s intelligence. Many children with such difficulties simply have a different technique in handling information than their peers. If you’d like any more information on how you can help your child overcome any issues they have with these difficulties, please see our article here. If you’ve been contemplating replacing your glasses with contact lenses, then this article is for you. We understand the idea of wearing contacts can be daunting for some, so we have created a list of reasons as to why we love wearing contact lenses over glasses! Unlike glasses, contacts are natural, they let people see your eyes. No more frames or thick lenses getting in the way. You can wear your contacts in any weather. Unlike glasses, they won’t collect precipitation, fog up or cause blurred vision for you. Pilots, sports people, drivers, surgeons and other professionals who need to see as much around them as possible, can safely use contact lenses. Glasses can obstruct side vision, posing as a challenge to these professionals. Glasses can be restrictive, and often get in the way of your everyday activities. Wearing contacts allows you to do the things you love without the restrictions. You can easily play sport, exercise, swim, go out with friends, drive and do so much more when you wear contact lenses. Contact lenses are worn right on the eye, so they give you more natural, crisp vision. No weight is felt on your face while using your contacts. When you wear your glasses for long periods of time, you can sometimes have uncomfortable weight on your face and behind your ears. There is no risk of breakages when wearing contacts, because unlike glasses, they won’t slip or fall off your face. When you wear contacts, you have the freedom to wear any pair of sunglasses you want. Often, the choices and ranges for prescription sunglasses are limiting, which can very frustrating for some. If you’re considering switching from glasses to contacts, then we suggest booking an appointment with our lovely optometrist, Andrew Godfrey. When it comes to fitting custom contact lenses, Andrew is your go-to guy. He introduced hybrid contact lenses to Western Australia to help people who find hard contact lenses uncomfortable. There are very few practitioners left who specialise in this area. Call us today to book your appointment! If you are over the age of 40 and have noticed that your vision is a little blurry – almost as though you are looking through a cloudy piece of glass or foggy window – then it’s time to book an eye exam with your optometrist immediately. This ‘fogginess’ is a often a sign of Cataracts. Cataracts is a ‘clouding’ of the eye’s lens, which happens when the proteins in the lens becomes defective and forms a mass, hence blocking light from passing through the eye. It often occurs naturally as one is aging and can sometimes lead to loss of sight. Nuclear Cataract: This occurs due to aging. It develops right in the central zone of the lens. Cortical Cataract starts in the outer part of the lens and works through to the center, with a white, wedge-like, non-transparent look. Subcapsular Cataract can be found at the back of the lens. People that take high doses of steroid medication are at a greater risk of getting this type of Cataract. First and foremost, we recommend to quit smoking! Furthermore, reduce your exposure to sunlight by wearing protective eyewear and wide-brimmed hats, and try to incorporate Vitamin E and other carotenoids from foods and supplements into your diet, like green leafy vegetables, fruits, nuts and seeds. It is also a good idea to reduce or stop your alcohol consumption. In recent years, the use of computers and smartphones among children has increased dramatically. Research has confirmed the fears of many pediatric eye doctors that the alarming use of computers and the likes can put them at risk for early myopia and developing symptoms of Computer Vision Syndrome (CVS). Children can sit for hours in front of a screen, whether it be at school or at home, and over time, this can strain their eyes and make it difficult for your child’s vision system to focus. Computer Vision Syndrome describes a group of eye and vision-related problems that result from prolonged computer, tablet, e-reader and cell phone use. It is also referred to as Digital Eye Strain. 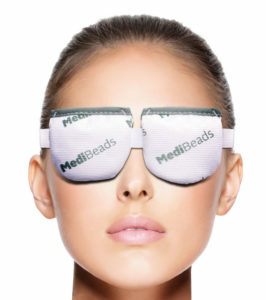 CVS symptoms are eyestrain, neck and shoulder pain, blurred vision, headaches and dry eyes. These symptoms are worsened by continuous glare on a computer, poor seating posture, poor lighting, improper viewing distances and a combination of these factors. Upper arms should be kept relaxed and close to the body, not angled away from sides or tilted forward. The child should avoid slumping forward over the keyboard but should keep the back straight and shoulders back but relaxed. The head should be balanced in the neck and not tilted. The computer screen should be positioned approximately 15 degrees below eye level. Forearms should be kept flat on the desk, with the elbows forming at least a 90-degree angle. The 20-20-20 rule should be followed: Your child should rest his or her eyes every 20 minutes by looking 20 feet in front of him for 20 seconds. You as an adult should also follow these tips to avoid the development of CVS. There are many options used in the treatment of CVS. Your optometrist will determine which is right for your child. One method is the use of eye drops. 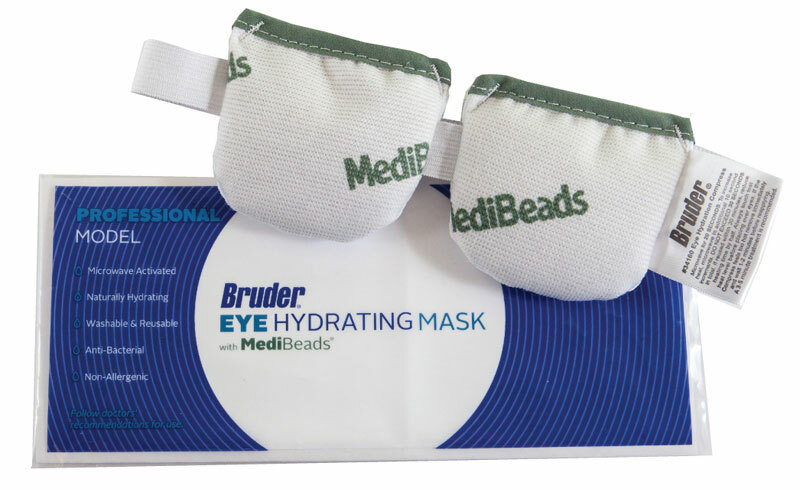 This helps with the moisturizing of the eyes to avoid or stop dry eyes. Another method is the use of special glasses designed to help prevent the problem of focusing and eyestrain associated with Computer Vision Syndrome. Your optometrist will advise if this is the right option for your child. If you suspect your child is spending too much time behind a screen, whether it be at school or home, please book an eye appointment with our wonderful optometrist Dr. Jean-Pierre today.